Nine music industry professionals and performers who helped influence the City’s music scene and global legacy will be honored Saturday on the Asbury Park Boardwalk. 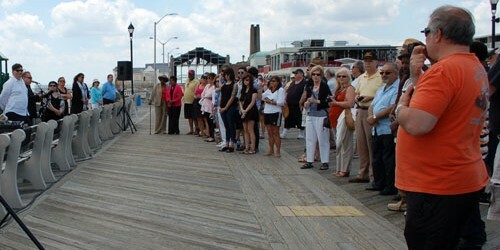 Selected by the Asbury Angels Project, plaques donning their names will be added to the “Boardwalk of Fame,” which currently honors 40 musicians, tech support personnel, DJs, journalists, club owners, record company employees, managers and promoters. The Asbury Angels are comprised of a panel of music industry professionals and historians. Their criteria in choosing inductees include significant contribution to the creative music community and the impact on that community; and the length of time spent on the Asbury Park music scene. Those eligible for consideration must have been deceased for at least one year. For more information, visit their website, Facebook and Twitter pages.